Kind old doctor cheering you up. Speech of old cheerful pediatrician, bright blurred windows in hospital background. 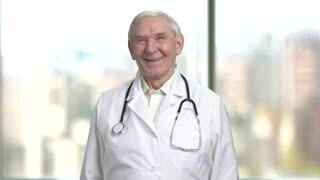 Kind old doctor cheering you up. Speech of old cheerful pediatrician, green hromakey background. 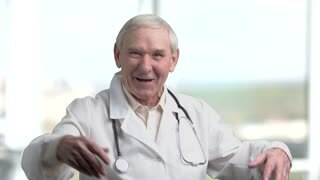 Old doctor laughing and putting hands up. Aged friendly physician bright, blurred windows in hospital background. Portrait of an old doctor telling jokes anecdotes. 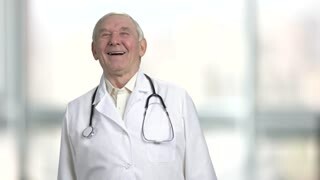 Cheerful senilr pediatrician cheering up. Bright windows background. Front view cheerful senior doctor laughing hard. Portrait of a jovial old male doctor in lab coat and stethoscope. Bright abstracrt blurred windows background with view on city. Pointing at the pack of medicine pills. Smiling very old doctor recommed pills to you in hospital, bright blurred background.